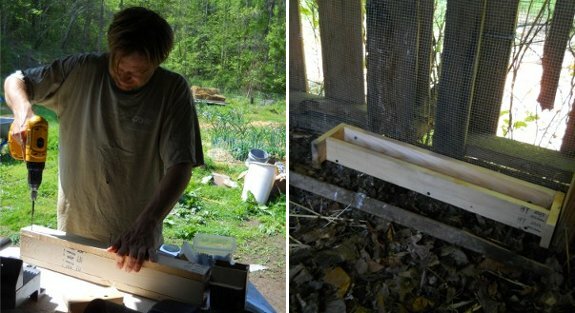 A simple chicken feed trough can be built with furring strip sections and 10 drywall screws. This cheaper quality wood demands the use of a pilot hole when drilling near the edge, otherwise you run the risk of cracking it. I made one of these last year, with scrap 3/4" pine, mine featured a V shaped trough. Same basic design, works very well, except the birds like to walk on/in it and poop sometimes. I was thinking of adding a bar, raised up and centered down the length, with a loose pipe or tube slipped over the bar. I'm hoping this would cause the chickens to fall off if they try to perch on top. Eric --- This is for the mature laying flock, so we're hoping the size of the hens (big) vs. the size of the trough (small) will prevent that. We'll soon see! I like your spinning dowel idea. Dave --- Sounds like you and Eric are on the same wavelength.